Will Algorithmic Tools Help or Harm the Homeless? 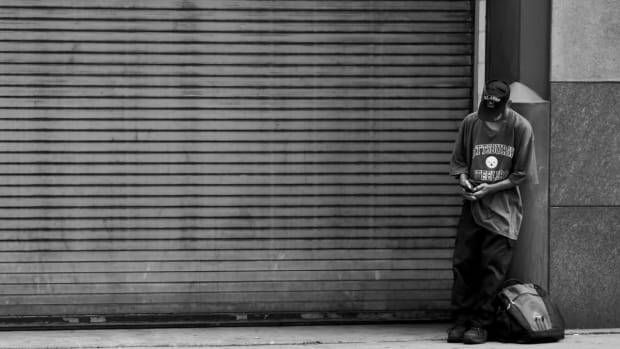 Researchers created an algorithm to identify the people most at risk for long-term homelessness in Los Angeles. Some worry the tool itself poses risks. 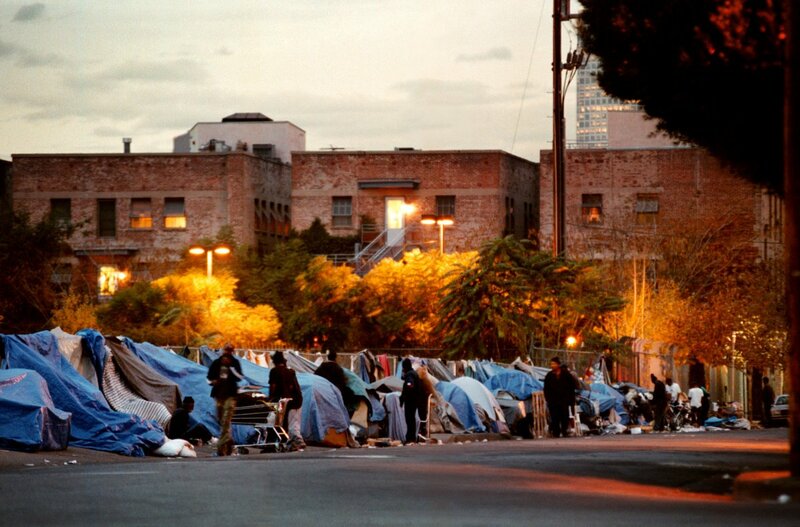 A homeless encampment in Hollywood, Los Angeles. 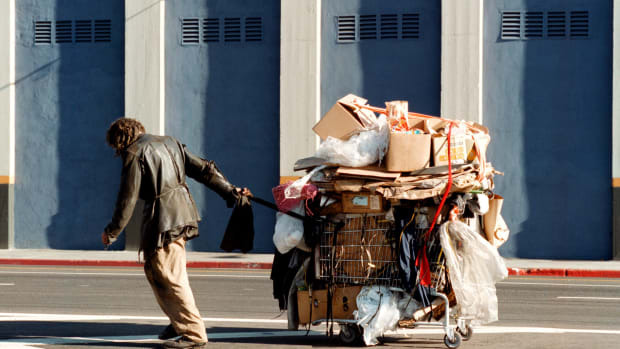 On any given night, more than half a million people in the United States are homeless. Many who lose their housing do so only briefly, but 40 percent become chronically homeless. Currently, many city&apos;s social service programs operate within a "progressive engagement" model that prioritizes providing aide—things like housing subsidies, behavioral services, and job training—to the people who have been homeless the longest. There&apos;s an obvious logic to this distribution method: People who have struggled the longest may be the most in need of help. However, the longer people are homeless, the more difficult it becomes to help them. The persistently homeless sustain $10,000 more in costs—medical and otherwise—every year than those with housing. "After all of the wreckage of being on the sidewalk for a year or three, health problems double, substance abuse goes up, and police encounters go way up," says Daniel Flaming, the president of Economic Roundtable, a non-profit that does policy research on issues like homelessness. But what if there was a way to identify the people most at risk for persistent homelessness and offer them aide, altering their course and preventing years of untold suffering and expenses? Economic Roundtable thinks they have developed a tool that can, according to a new report. The report introduces two statistical modeling tools that aim to pick out the adults most at risk of becoming chronically homeless after losing their jobs and the children receiving public assistance most at risk of entering long-term homelessness during their first three years as adults. The tools were developed using Los Angeles&apos; unusually extensive, linked, and publicly available pool of data for county residents who receive food stamps, Medicaid benefits, and other social services. In most cities, this kind of data is hard to acquire and difficult to synthesize across different social-service agencies, Flaming says. So Economic Roundtable&apos;s access to this much data gives their tools a unique ability to predict chronic homelessness risk. "It&apos;s being able to have your arms around an entire population," he says. Homelessness policy experts believe the tool—or one like it—will be crucial in slowing the growth of homelessness. "If we don&apos;t do something to stop the flow, the dynamic processes that lead people into homelessness will be playing catch up forever," says Gary Blasi, a University of California–Los Angeles law professor and longtime advocate for the unhoused who sits on the Economic Roundtable board. As the homelessness crisis becomes increasingly impossible for the public to ignore, some areas have begun to devote more money to homelessness services, but the Economic Roundtable believes the funding is not always being spent very efficiently. 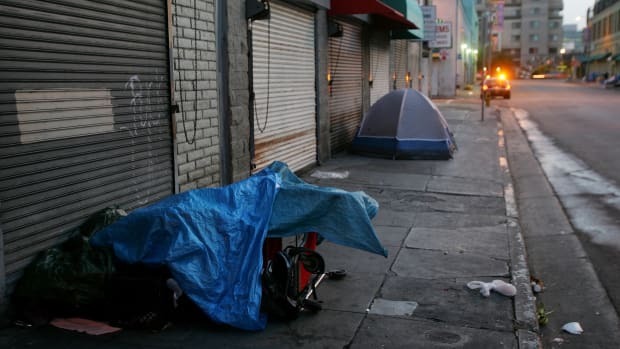 In Los Angeles, where the homeless population has spiked by half over the last decade and 75 percent of the city&apos;s 58,000 homeless people are unsheltered, a small sales tax increase passed in 2017 is projected to add $3.55 billion for homelessness services over the next decade. "That is a continuous flow of money that can be used either effectively or ineffectively," Blasi says. "And right now," because of progressive engagement, "it&apos;s being spent in ways that are not necessarily contributing very much to the reduction of homelessness." The recent influx in money for homelessness services, while significant, is not remotely enough to provide permanent housing for the persistently homeless—in major cities it costs about half a million dollars to build a permanently subsidized apartment for a chronically homeless person, Flaming says. So cities have to figure out how best to ration that funding, despite the fact that most homelessness researchers agree that the only surefire solution to the crisis is providing more housing. "Housing: there&apos;s simply not enough of it," says Beth Weitzman, a professor of public health and policy at New York University. "We can&apos;t obscure that main point." Economic Roundtable&apos;s tools aim to provide a methodology for how to target that rationing in a way that might have the most impact. By identifying the adults and children most at risk for long-term homelessness, the tools can be used to offer packages of social services—say, reemployment services for at risk people who have just lost their jobs, medical benefits when other targeted individuals visit the hospital, perhaps legal services for those with criminal records. But the tool itself is not a homelessness services program, and the Economic Roundtable report does not spend much time discussing what kind of program would be administered to the people identified by the tool. "At that point, the work of the tool is pretty much done," Blasi says. "Then you have to actually talk to the person and look at what their circumstances are, and offer whatever it is that that person needs." Many cities—including New York and Los Angeles—currently offer pieces of the type of social services that Flaming and Blasi describe, but few offer them as a single package, and none have the ability right now to direct them to the people most at risk for chronic homelessness. "It&apos;s kind of like the holy grail," Weitzman says, of this specificity of targeting. "Economic Roundtable is in the vanguard here." A few government programs have experimented with targeting methods to distribute social services in the recent past. The Veterans Administration has been using a number of different targeting methods to screen veterans for homelessness, and New York&apos;s HomeBase program uses some targeting to determine the recipients of limited homelessness services. But Economic Roundtable&apos;s tool is unprecedented in its specificity. And it could stand to make the distribution of social services more objectively determined—and probably less racist. When New York implemented targeting, Beth Shinn, a homelessness policy expert at Vanderbilt University, says they discovered that their social workers had previously been more likely to give services to people who had graduated high school, and who were employed, despite the fact that these people were statistically a lower homelessness risk. "Right now, these decisions are made ad hoc, as a result of people&apos;s subjective impressions, Blasi says. "So it&apos;s reasonable to think that the way we&apos;re now allocating resources is probably biased against African-American men." "But," Weitzman notes ominously, "the decision lies with the algorithm." The consequences of that decision, however, rest on the humans affected. One risk of targeting programs is with what social scientists call "labeling"—where identifying someone as high-risk becomes a self-fulfilling prophecy. A famous study that introduced some of the strongest evidence for this concern is the Cambridge-Somerville Youth Study: in the 1930s and &apos;40s, researchers provided an array of services (counseling, tutoring, recreational trips) to a group of boys who were identified as "pre-delinquent." The recipients of the program fared far worse than the control group. Though a few explanations of the study&apos;s outcome have been proposed, one of the study&apos;s researchers proposed that labeling the boys as "pre-delinquent" resulted in behavior that fit their assumed designation. Similar concerns have since been raised about academic "tracking" programs in schools. It&apos;s possible that, depending on how the programs are implemented, labeling those most at risk for long-term homelessness could also harm them. The tool&apos;s drawbacks may also stem from its virtues—especially in cities with a social services system more fragmented than Los Angeles&apos;. "It&apos;s a strong but very complicated model," Weitzman says. "They use tons of data, which makes them very good at predicting, but makes their model hard to implement on the ground." Data collection and coordination across numerous city, county, and state agencies that don&apos;t necessarily communicate with each other can stand in the way of a tool that relies on cross-referenced data. Flaming, of Economic Roundtable, also recognizes these challenges for his tool. "It&apos;s hard to get large public sector systems to change," he says. Centralizing all their different services and data is a tricky business for public agencies." There are also worries that a tool like Economic Roundtable&apos;s could be put to nefarious ends. Let&apos;s say, perhaps, a city were hosting the Olympics in a decade and wanted to quickly remove its homeless community from sight. Could cruel administrators use the tool to identify the people likely to end up persistently homeless, and give them all bus passes to Phoenix? Many cities have already been systematically relocating their homeless populations for decades with programs that offer free bus tickets for the unhoused who move to different cities. Such programs could become even more efficient with data-rich targeting tools. Flaming is mostly dismissive of the possibilities that his tools could be used to such ends. "Our tool is offering people a benefit, it&apos;s not putting them at risk," he says. "And police sweeps are already steadily dispossessing people and moving them from street to street. You don&apos;t need a model to do that. That&apos;s pervasive right now." Weitzman agrees. "In some ways, algorithms and big data are not that efficient," she says. "They&apos;re amazing at identifying trends—likelihood, things of that nature. They&apos;re less good at the individual level." Instead she, Blasi, and Shinn worry more about the privacy issues that these massive data-sharing programs raise. Even if the data is only put to positive uses, these programs subject the poorest residents of a city to invasive questions about mental-health history and personal circumstances that wealthier residents will never have to endure. Despite these potential concerns, all the researchers I spoke to saw the Economic Roundtable tool as a step forward for public policy that seeks to reduce homelessness—if one that should be closely scrutinized. "I think there always needs to be healthy dose of skepticism when there&apos;s kind of a pronouncement of finding the answer," Weitzman says. "But this is an important contribution to figuring out the answer." 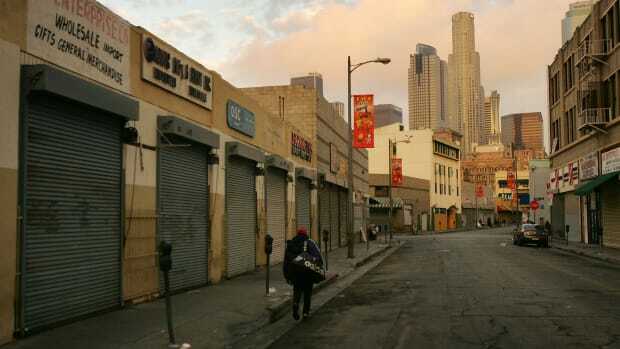 Despite a federal court ruling that reinforces the rights of the homeless, Skid Row residents live in fear of losing what little they have. Why Can't We Get an Accurate Count of the Homeless Population? 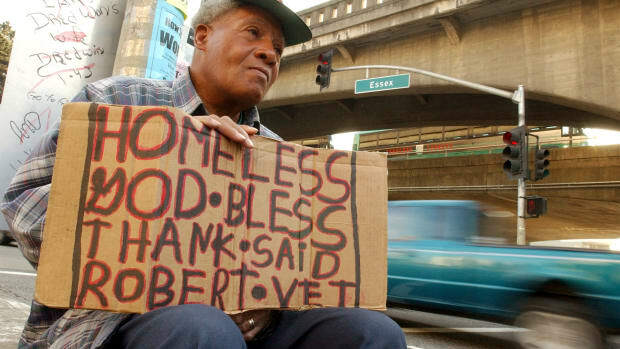 HUD requires communities to send out volunteers to tally homeless individuals one by one, often undercounting the number of people experiencing homelessness. 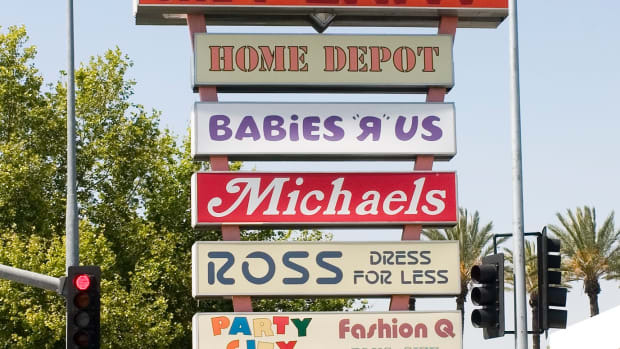 And the sad history of a Los Angeles shopping center. Pacific Standard writer Jack Denton speaks with a childhood friend about the daily realities of living without a home. Can Mobile Apps Help the Homeless? Can newly developed mobile applications help the homeless, when access to technology is unreliable at best? Residents can get up to $75,000 to build a "granny flat"—if they open it up to a homeless family.